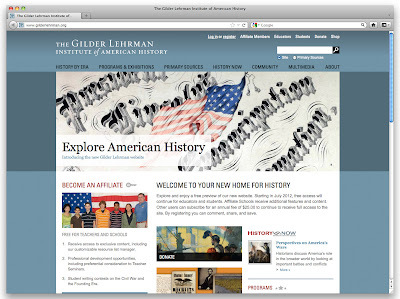 The Gilder Lehrman Institute of American History recently rolled out its new website. It's clean, well designed, easy to navigate, and a major improvement over the previous version. (Still, the new format will take regular users some time to master.) I think the "History by Era" section (see below) is far more intuitive than what the site had before. And that goes for other pages as well. Over the years, I've used the Gilder Lehrman site quite a bit. It's wonderful for gathering material to use in class: ideas for short assignments, summaries of important events, primary sources, bibliographies, and links to all sorts of related items. An online curriculum and resource center but not a textbook, Gilder Lehrman’s new site presents a chronological and thematic look at American history through a range of different voices, with fifty original essays by renowned historians, including six Pulitzer Prize winners. . . .
Central to the Gilder Lehrman Home for History is “History by Era,” the Institute’s innovative approach to the American history curriculum with a focus on literacy. Through podcasts, interactive features, online exhibitions, timelines and terms, primary sources, teaching tools, and content spanning all of American history, “History by Era” offers a wide range of views of the important people, places, and politics in American history. Other highlights of the launch will include a special double issue of the quarterly journal History Now on military history; and Gilder Lehrman’s first online course for graduate credit, “Civil War and Reconstruction.” The new site also offers improved search capabilities and more transcripts and digital images than ever for the catalog of the Gilder Lehrman Collection, a holding of more than 60,000 historical documents. Learn more about the Gilder Lehrman Institute of American History and find out about events, activities, and prize competitions here.